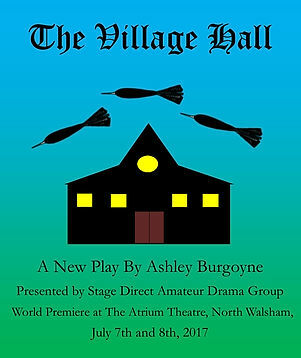 Local classical guitar teacher, Ashley Burgoyne, will be premiering his new play �The Village hall� at the Atrium Theatre, North Walsham this summer. The play will be presented by Stage Direct who have previously had successful shows at the Atrium in 2013 and 2014 along with many years of experience of putting on performances at various prestigious venues such as the Granary theatre at Wells and in the Sheringham little theatre. Stage Direct boasts of having a clutch of talented writers in their midst with more debut plays planned in the near future. Ashley a former Paston college student currently teachers the guitar at schools in North Walsham and the surrounding area. He joined Stage Direct Drama group five years ago and has been either a member of the cast or crew in many of their productions. There is also some incidental music within the production; �As a music teacher I couldn�t resist composing some music for the production!� added Ashley. Apart from long term members, there will be three new, younger members joining the production. Shania Waterson (Former student at Cromer academy) and Robert Wright (former student Aylsham High) are both currently studying at City college and daisy Groom, currently studying at Aylsham high school, will be making their Stage Direct debut. Front of house staff for this production will be members of Friends of Colby school, with all profits going to this charity.